latest film, Interchange, which opens in cinemas at the end of the year. I believe Interchange is going to be an exciting film. was never released here by the producers. Putting this devastating incident behind him, in 2011, Dain went on to direct Bunohan, a thriller drama about an intense relationship among three brothers and their ailing father. time at several prestigious international film festivals. It also earned Dain a number of accolades, including best director and best picture, at the 25th Malaysian Film Festival. Now, everyone is eagerly awaiting his next film, Interchange. Made with a budget of RM3.5 million, Interchange centres on forensic photographer Adam (played by Iedil Putra), who becomes psychologically traumatised after having to photograph endless pictures of the dead. Adam locks himself in his condominium and soon develops a habit of secretly taking pictures of his neighbours. getting angry, she befriends him and becomes his lover. gets dragged into a world filled with blood and gore. There is no doubt that featuring tortured souls on the big screen is not a new thing for Dain. Is the director a tortured soul like his characters? Interchange also stars another award-winning Indonesian actor Nicholas Saputra. The inclusion of these two Indonesian stars has led to some people insinuating that Dain does not have faith in Malaysian talents. The director brushes this accusations aside. “One of the best things about our industry is our amazing actors,” he said. He explained that the plot features a tribal community from Borneo that speaks in an Indonesian dialect and hence, using Indonesian actors makes perfect sense. had always wanted to work together. films, and he does the same in Interchange. 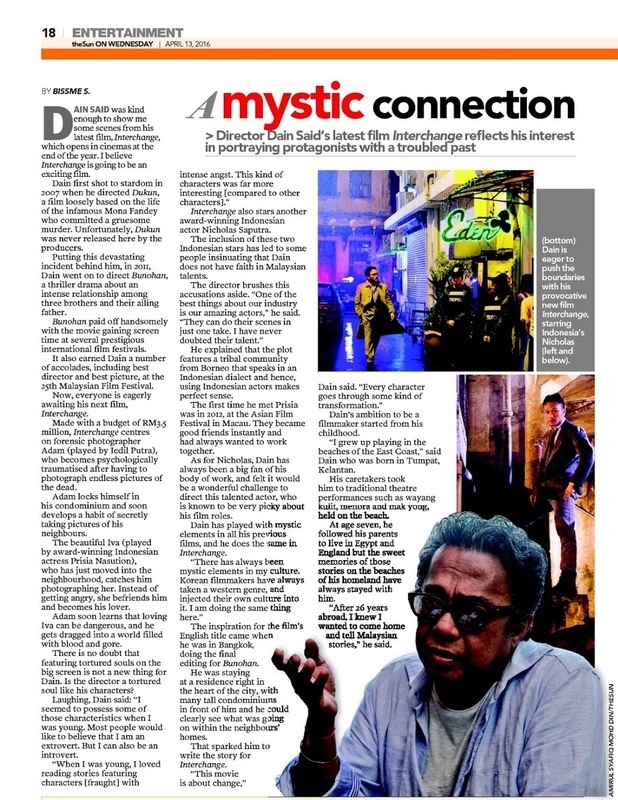 The inspiration for the film’s English title came when he was in Bangkok, doing the final editing for Bunohan. many tall condominiums in front of him and he could clearly see what was going on within the neighbours’ homes. That sparked him to write the story for Interchange. “This movie is about change,” Dain said. Dain’s ambition to be a filmmaker started from his childhood. 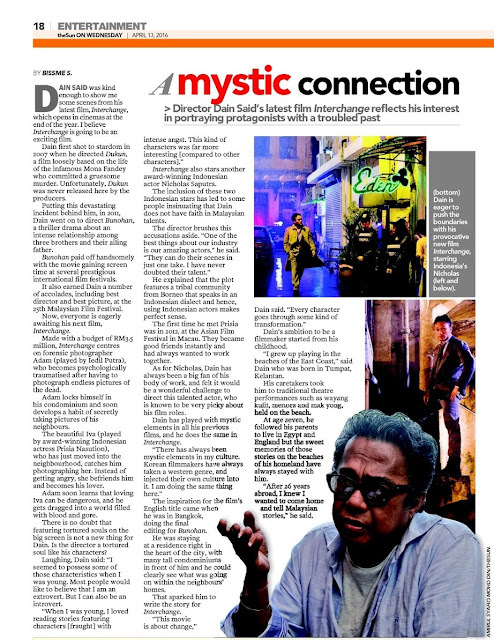 “I grew up playing in the beaches of the East Coast,” said Dain who was born in Tumpat, Kelantan. His caretakers took him to traditional theatre performances such as wayang kulit, menora and mak yong, held on the beach. of his homeland have always stayed with him.